The new Optima MR450w system from GE Healthcare, part of a $3 million project in a new wing at Hurley Medical Center in Flint. FLINT — Patients at Hurley Medical Center who need a Magnetic Resonance Imaging (MRI) scan no longer need to take an ambulance ride to get it. The procedure now is being done in-house thanks to a $1.5-million MRI system that is the only one of its kind located inside a hospital in Genesee County. Installed in late January and unveiled at an open house last week, the new Optima MR450w system from GE Healthcare is part of a $3 million project in a new wing at Hurley. It’s also good news for larger patients and those who suffer from claustrophobia. The state-of-the-art system has a weight capacity of 500 pounds (200 pounds more than the previous system) and a 70 cm opening which gives the patient more room while inside of the scanning tube, said Todd Williams, lead technologist for MRI at Hurley. Previously, patients coming from emergency or a hospital room had to travel by ambulance to an MRI site off the premises when an exam was needed, he said. The nearest site on Ballenger Highway was jointly owned by McLaren, Genesys and Hurley, he said, adding that the consortium has been dissolved and the other two hospitals took over existing facilities that were located closest to them. Hurley’s new on-premise system also provides better efficiency to out-patients who are offered valet parking and bypass the admissions desk when coming to the hospital for an MRI, said Ilene Cantor, Hurley director of communications and public relations. 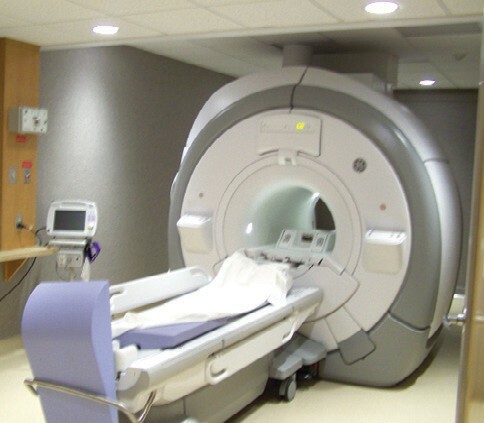 Originated in the 1970s, MRI scans com- bine the power of magnetic fields and radio frequency waves to create images that allow doctors to look inside the body without doing exploratory surgery. It transmits computer images to a monitor where they can be viwed and analyzed. The Optima MR450w has a 1.5T field strength which is the most widely used in the industry. Its higher magnet strength produces better image quality. And it can scan a patient from different angles without changing position. The procedure can be used non-invasively on the head, neck, spine, breasts, heart, abdomen, pelvis, joints, prostate, blood vessels and musculoskeletal structure of the body. It is used on all ages from newborns up, said Sundar Veeramani, Hurley radiologist. Radiologists and physicians have immediate access to results that can be viewed from any reader station in the hospital, he said. That time-saving aspect can be critical to very sick patients. Veeramani said he also can tell quickly if more scans are needed and request them immediately. Williams said the shortest exam lasts about 15 minutes but the process can take a couple of hours if multiple scans are ordered. “Our job is to give them great images so they can get an accurate diagnoses for the patient.’’ Williams said. Veeramani and Sturk were part of a scout team that toured the factory and tested equipment before selecting the one they have. For patients who still struggle with claustrophobia, children can be given anesthesia and adults are sedated, Sturk said.